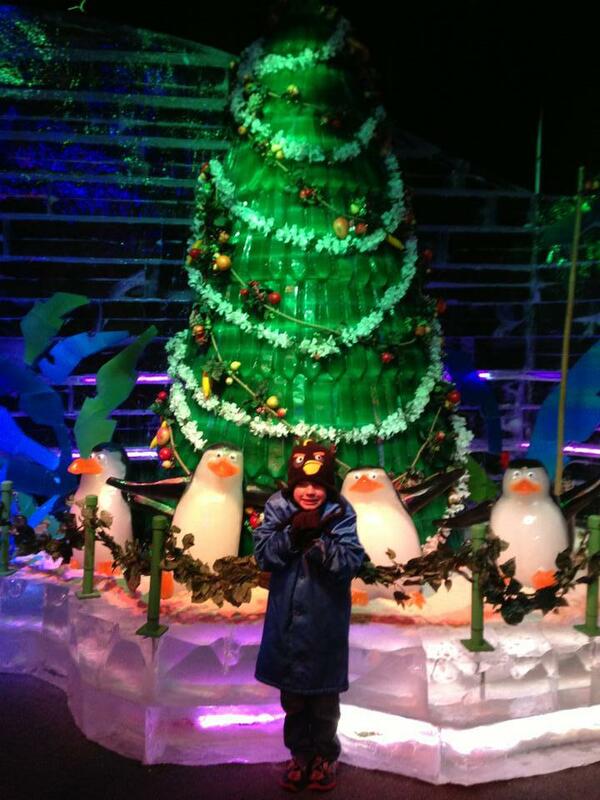 This year, Gaylord Palms welcomes Merry Madagascar as their theme for this year’s ICE! attraction. 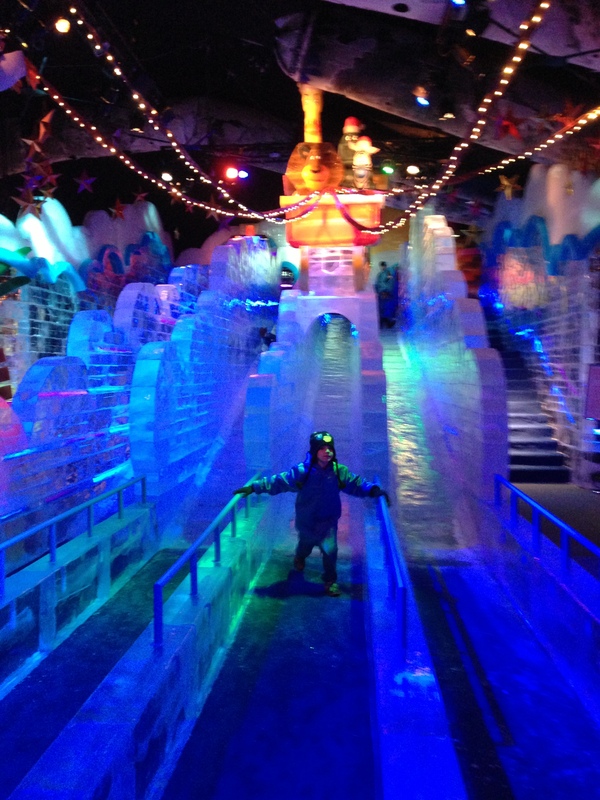 At nine degrees Fahrenheit, it’s by far the coolest attraction in the Orlando, Florida area. 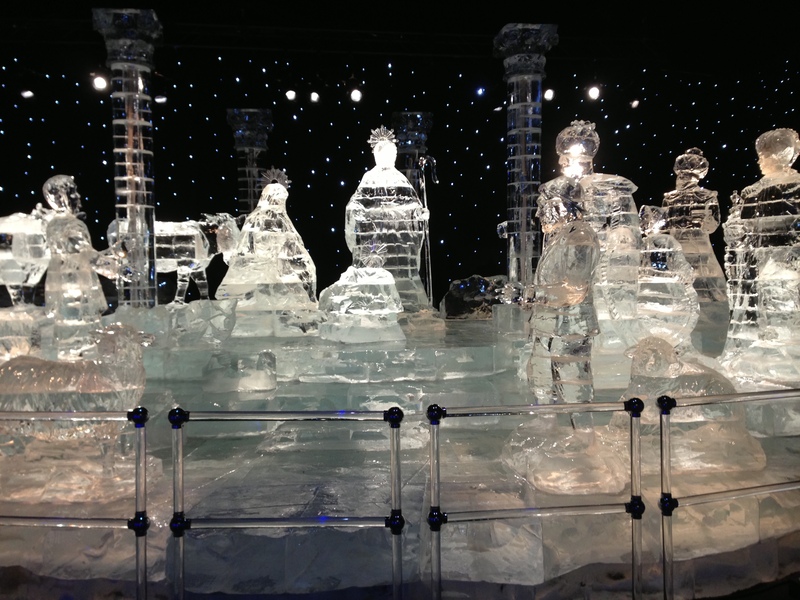 Each year, the theme has changed and I’m thrilled with the new direction the resort is taking with the frozen works of art. 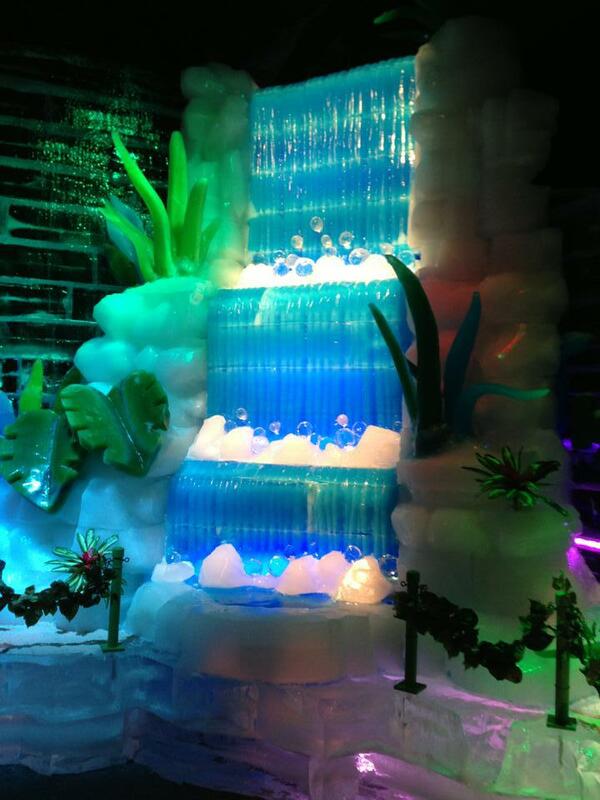 The first year I took my family to see the two million pounds of carved ice, the theme was the “Twelve Days of Christmas.” We had a blast, but something was missing. The kids knew the story, but they didn’t have that kind of amazement at the sculptures that the adults had. Last year, I saw just how creative the team of 40 artists from Harbin, China could be with their take on Shrek the Halls . Now, the story was something my son and other children could connect to and really feel because they’ve grown up loving the characters. 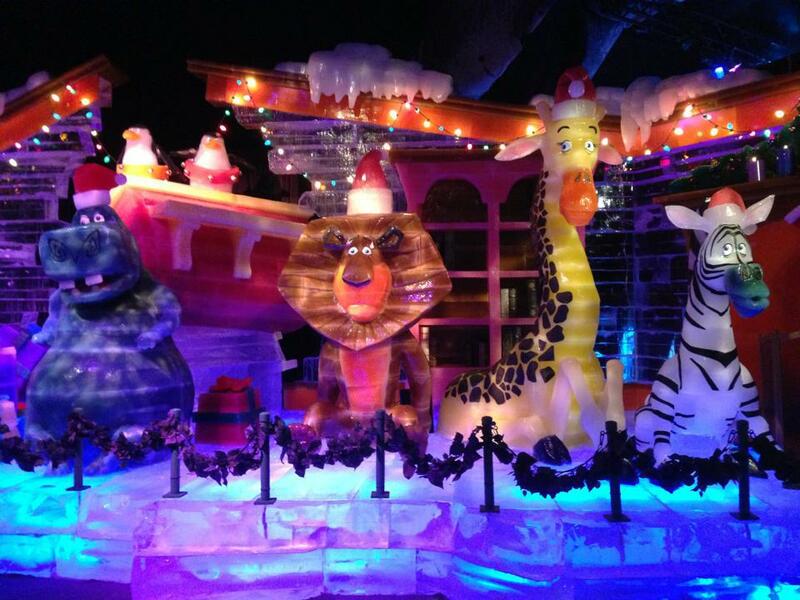 This year, the theme centers on the holiday movie Merry Madagascar , and just like last year, the sculptures are brilliantly carved, colored and the best scenes from the movie are fleshed out in ice. The ice slides were fun as always and my husband and son had a blast trying each of the four massive slides out!For the adults that might not be interested in the cartoon theme, the end of the exhibit is well worth shuffling through the scenes of dancing ring-tailed lemurs, hippos, zebras and lions (ohh my!). I don’t want to spoil it, so if you want to know more you will have to find the link in this article that shows you. If that doesn’t put you in the Christmas mood, head into the resort for some hot cocoa and enjoy the two million Christmas lights, 54-foot Christmas tree and other decorations around the atrium. If you can plan your trip just right, I highly recommend you check out the Luminescence – featuring the Edge Effect stage show. My favorite part was when the drummer went sky high and performed his beats on the drums hung above the stage. The best way to enjoy it all is by staying at the resort for at least one night, but you can still do everything in one day without breaking a sweat. The exhibit is open daily until January 1st, 2013 and is suitable for all ages; strollers are permitted Please keep in mind the weather inside is a chilly nine degrees Fahrenheit and in order to enter, you must be wearing pants, closed toed shoes and a shirt of some kind. Everyone is fitted for a parka before entering to ensure your comfort and safety while inside. I highly recommend you bring a jacket, hat and gloves as well. After about 10 minutes inside, my hands were hurting from the cold. In exchange for my time and efforts in reporting my opinion within this blog, I received a free tickets into the exhibit. Even though I receive this benefit, I always give an opinion that is 100% mine.